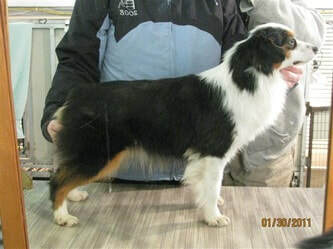 2011 ARBA #2 Mini Aussie - #6 All Breed. 2011 KCUSA #2 Mini Aussie - #6 All Breed. 1 Best In Show, 2012 Eukanuba Honor Roll Qualifier. ***Las Vegas NV - 2 Best Of Breed, 1 Best In Misc. ***Industry CA - 2 Best Of Breed, 2 Best In Misc. Rainy will be retiring and available to pet home in 2019. She will be spayed prior to leaving for her forever home. Planned litter with MercyMe Mayes Easy Ryder (Ryder). This will be Daphne's only litter. Daphne will be retiring and available to pet home in 2017. Immy will be retiring by the end of 2017. If you are interested in adopting Immy, please complete our online application. You must be willing to come to Kingman AZ and meet an adult dog in person before we would consider placing them with you.